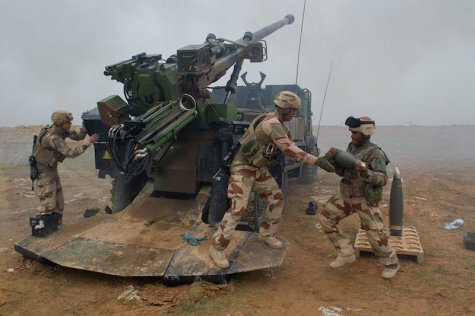 The French Army’s Wagram Task Force, deployed on the Iraqi-Syrian border, is providing artillery support to the coalition against Daesh's last pocket in Syria’s mid-Euphrates valley, near the city of Hajin. In recent days, taking advantage of a significant deterioration of the weather conditions that prevented any air support, fighters of the terrorist group Daesh tried to break through the Syrian Democratic Forces (SDF) encircling the pocket. Coalition artillery, comprising French CAESAR self-propelled guns, US Army M777 towed 155mm and M-109 Iraqi Army SP guns, intervened in support of SDF units. This resulted, for Task Force Wagram, in the provision of fire support and target neutralization, dislocating an enemy column of about forty vehicles. For the first time in combat operations, French gunners used the BONUS (BOfors Nutating Shell) precision-guided shells, firing four rounds which destroyed eight armored vehicles used by Daesh. The 155 mm BONUS artillery ammunition is intended for top-attack of armored vehicles, both stationary and in motion. This anti-tank shell is equipped with sensors and a target recognition device. It carries two directed-energy warheads that allow it to destroy several armored vehicles in a single shot. The BONUS shell is a self-contained munition, whose sensor and guiding devices are integrated into the munition and sweep the target area, allowing it to target only tanks or armored vehicles. In the event of a fruitless search of the target area, the ammunition self-destructs. "Without doubt, the successful use of the Bonus shell is a milestone, and will change the perception, that is still too widespread, that artillery" waters "the battlefield," said Colonel François-Régis, commander of the Task Force Wagram. At the heart of this mission, which brings together 74 countries and 5 international organizations, the French artillerymen demonstrate daily their ability to strike targets. Since mid-October, the Wagram Task Force has completed 335 fire missions. Nearly 150 gunners are deployed in Iraq to operate three CAESAR self-propelled guns. The unprecedented use of the BONUS shell in this large-scale operation illustrates the determination of France, which is firmly committed to fighting against Daech in the Middle Euphrates Valley. Launched on September 19, 2014, Operation Chammal represents France’s participation in Operation Inherent Resolve (IOR), and today mobilizes nearly 1,100 soldiers. At the request of the Iraqi government and in coordination with France's allies present in the region, Operation Chammal is based on two complementary pillars: a "training" pillar for Iraqi national security units and a "support" pillar. to support the action of local forces deployed on the ground against Daesh, and to strike the military capabilities of the terrorist group.